Herald: The DRONACHARYA of GOAN BASEBALL! Rahul Chandawarkar drives to Borim village to watch baseball coach Dilip Naik train the future of Goan baseball and comes away impressed. 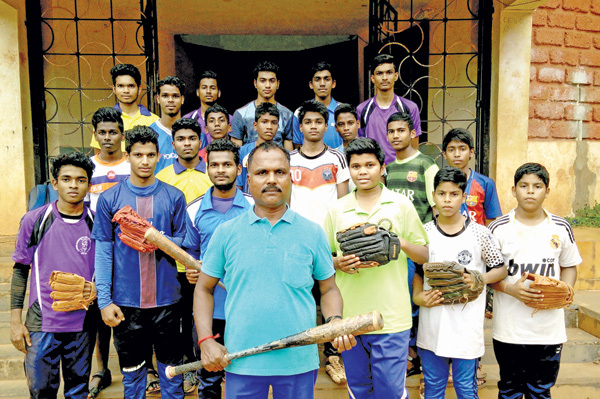 As the shadows lengthen on the small ground of the Swami Vivekanand High school in the hilly village of Borim in East Goa, the only voice that can be heard is that of the baseball coach, Dilip Naik. Loud and clear instructions of ‘steady’, ‘good throw’, ‘watch the ball’, ‘catch the ball’ are being belted out by Naik, the school’s energetic, physical education (PE) teacher and baseball coach. A former footballer and baseball player, Naik(53) is understandably very fit and agile. His face is a study in concentration and focus. Not a single movement by his wards, both girls and boys escapes his attention. Naik has been with the school for 27 long years and is arguably the most proficient baseball coach in the state of Goa. Coaching players in this school and on this very same ground, Naik has produced India International baseball players like Claudia Vaz, Kavita Auti, Deepalaxmi Auti and Geeta Parwar to name just a few. All these players, were students of the Swami Vivekanand school in Borim and are recipients of the state government’s prestigious, Kerkar sports award. In more recent years ( 2016-18), Naik’s baseball students include, Nishant Satarkar, Ajinkya Gawde, Gajesh Gawde, Pradosh Naik, Ankita Gawde, Pradnya Gaonkar and Stizva Vaz, all Goa state baseball players. Baseball, an American import is relatively a new sport in India. According to Naik, the credit for introducing the sport in India goes to the duo of PC Bharadwaj of Delhi and P Nagaraj of Bengaluru in the year 1990. Today, the sport is governed in the country by the Amateur Baseball Federation of India (ABFI) which has 25 participating state teams including Goa. According to Naik, the Indian national baseball team has bagged a silver and a bronze in the Asian Cup tournaments and the Indian women’s team has finished eighth, two times in the World Cup. Naik was inspired by the Bengaluru baseball guru, P Nagaraj in the early nineties and camped in Bengaluru for three months to study the game. Naik, was among the first PE teachers to learn and introduce the sport in Goa in the year 1993. And though the state association was formed soon after, there was no state government funding for the sport until the year 2000. “The first six-seven years were very tough for the sport in Goa. My friends and I spent money from our own pockets to train players and take the state team for national tournaments,” Naik said. It is here that Naik remembers former South Goa MP, Ramakant Angle fondly. “It was Angle Sir who supported the sport and the state baseball association wholeheartedly during that testing period. The sport of baseball in Goa will forever remain indebted to him,” Naik said. Young Goans, took to baseball like fish to water and began making a mark at the national level. “Yes, our girls and women teams starting winning the national gold medals very soon. The senior boys took some time, but the cliff hanger that they won against Delhi to be crowned national champions in 2004 is etched in my mind,” Naik said, as he proceeded to describe the game in great detail. According to Naik, the sport of baseball is played predominantly in the seven, Goan talukas of Ponda, Canacona, Salcette, Vasco, Tiswadi, Bardez and Bicholim. “Close to 50 schools and about 10 colleges play this sport in Goa,” informed Naik. Naik rued the fact that Goa state, despite winning laurels at the national and international level did not have a dedicated baseball stadium. “Baseball is a unique sport and needs a small, but special stadium. Sadly, we still do not have a stadium dedicated to this sport in Goa,” Naik said. Chatting with Naik for over 30 minutes, one gets the clear impression that baseball is indeed his life now. “You are absolutely right. Baseball is my life now. I have produced national and international players in this sport from this small ground in Borim. Many of my baseball students have become PE teachers like me and are promoting the sport, while some others have secured well-paying jobs and lead a disciplined life,” Naik said. Naik, who has not earned any awards for his hard work pooh poohs the thought. “I do not worry about awards. My successful baseball students are award enough!” says the dedicated coach.